So glad the weekend is here! Two reasons, my husband is home from travels and my work was exhausting this week. I like it when he's home. And... Fit just what I wanted to say. The background on this card is awesome. Very cute card. Hi Rebecca! Your card looks totally AWESOME!! I love the sweet bees and the hearts,and how you coloured the word 'together'. The hexagon background looks wonderful!! Great card! Awww! What a sweet card for your hubby! :) Love the honeycomb BG...could almost pass as being the real thing!! Love all the texture on this! Oh - I just LOVE all the sparkle and shine on this card! So pretty! Love those sparkling, buzzy bees! Oh my! Your card is adorable! Is the honeycomb embossed and then covered with glossy accents??? Wow! Your card is amazing! Love that texture and how you colored the sentiment! So cute! I love the sparkle and embossing! 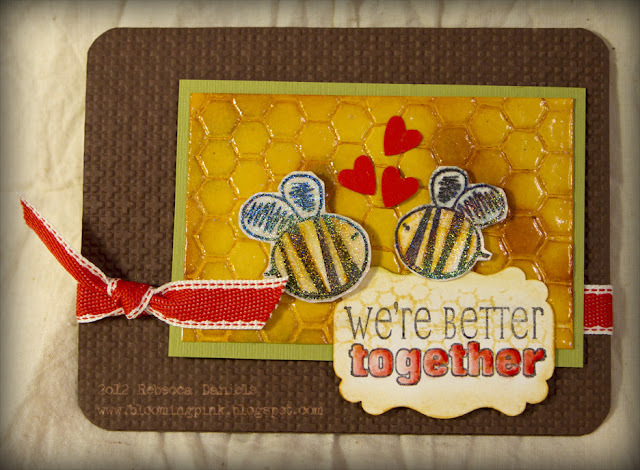 That honeycomb background is amazing and I love your glittery bees. Fabulous design! Like everybody, I am seriously impressed by that fab honeycomb panel! What a sweet -- ha! ;) -- card. p.s. Thanks for the running comment on my blog! I've actually been training for a run - 10km and it's tomorrow. Getting nervous... might have to go craft to relax myself... have a great weekend and good luck on your run! Loving your honeycomb background...just awesome!! Just as I stated on the Unity FB page, this card is so sweet, a tutorial is definitely in need!! Love the background! Awesome card! Yeah, being together with the hubby is my favorite, too! Love the bg, now I have to go back to find and read the comment you left on how you made it! Have a great weekend! I need a tutorial on this card. Is that honeycomb background a texture folder? This is a great card. Hope you're enjoying the weekend! That honeycomb background is absolute GENIUS!!! 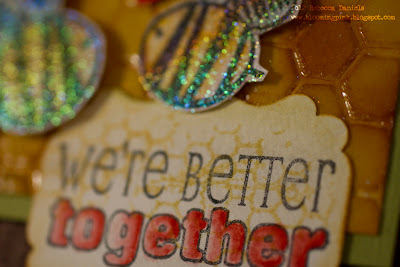 Love the glittery bees :) Your hubby is going to cherish this! Yes, please tell us how you did that BG. That is one cute card! Nice card. Love the background. Is it embossed? very cute! love the texture!